Federal Reserve Chairwoman Janet Yellen raised concerns Wednesday that deficits, which are expected to be driven higher by the tax plan now in Congress, may give policy makers little room to respond to a future recession. At her final press conference as Fed chair, Yellen reiterated her persistent fears over the national debt. "This is something I've been saying for a long time," Yellen said, responding to a question by CNNMoney about the potential fiscal impact of the tax proposals. "I am personally concerned about the U.S. debt situation. Taking what is already a significant problem and making it worse, it is a concern to me," she said. The national debt held by the public has nearly tripled over the past decade to about $15 trillion today. Yellen has said America's debt burden "should keep people awake." And the problem will likely worsen as more people tap Medicare, Medicaid and Social Security -- outpacing tax revenue. The Joint Committee on Taxation, the congressional scorekeeper for tax bills, has estimated the Senate version of the tax bill would add an estimated $1 trillion to deficits. 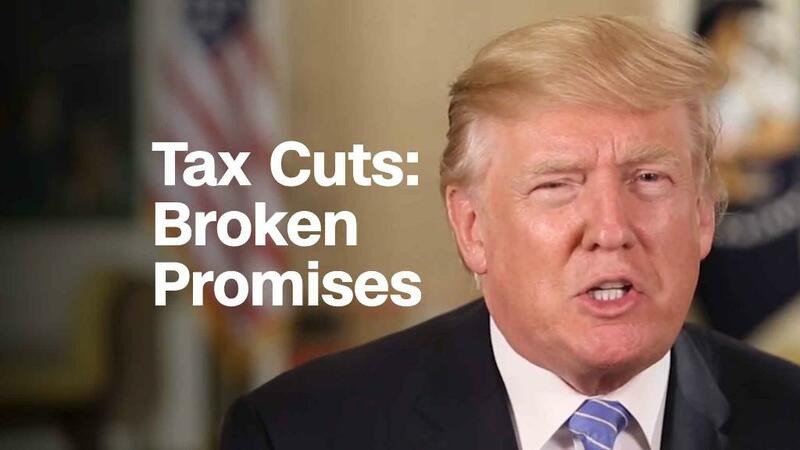 Economists worry tax cuts that will deepen the national debt while the economy is healthy will leave Congress with less room to respond to a fiscal calamity. New York Federal Reserve Bank President William Dudley has cautioned against injecting additional stimulus through tax cuts when the economy is already growing at a pace that is likely to increase inflation over time. "[T]he economy doesn't need it," Dudley said in late November. Usually when the economy needs to be rescued, the president will ask Congress to borrow vast sums of money to pay for tax cuts. But lawmakers are now on the verge of enacting a $1.5 trillion tax plan with an economy enjoying its best growth in three years. The recovery from the Great Recession is now in its eighth year. It's already the third-longest expansion in history. While few economists anticipate an imminent downturn, another one will come eventually. And when a recession hits, the government's borrowing costs may not be as absurdly cheap as they are now. "It does suggest that in some future downturn, which could occur just for whatever reason, the amount of fiscal space that would exist for fiscal policy to play an active role will be limited," said Yellen. Still, the outgoing Fed chair said the U.S. central bank welcomed tax changes to help grow the economy. She said most policymakers accounted for an economic boost from the proposed tax bill in their updated economic projections. And for now, officials didn't think it was necessary to change their plans when it comes to future rate hikes. On Wednesday, the Fed raised rates one notch higher as the U.S. economy continues to get healthier. It also maintained its plans to raise rates three more times in 2018, and then twice in 2019. Some analysts have suggested the Fed may have to raise rates faster next year should the tax bill prove to deliver a bigger stimulus to the economy. The Fed also said it now expects the economy to grow in 2018 at a faster rate of 2.5%, compared with its previous forecast of 2.1%. Yellen said tax reform was one factor among many that policy makers considered in lifting the country's economic prospects next year. -- CNNMoney's Matt Egan contributed to this report.